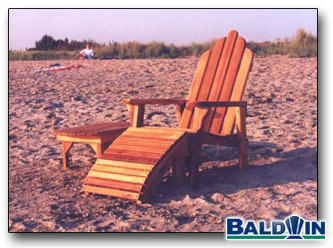 We don't expect many people will carry Baldwin Furniture down to the beach because it is somewhat heavy. We want it to be heavy. Heavy is piece of mind that you furniture isn't going to blow around during a thunderstorm while you're at work. Heavy means your kids and grandkids can climb all over it and it will not break. Don't get the wrong idea... Our furniture is heavy in a good way. A Lawn Chair weighs only 30 pounds thats heavy enough to stand on its own in a strong wind, but light enough to move around the yard.